Growing up in Marion County, S.C., in the 1970s, I could not at the time appreciate the incredible wonders of my mother, Thelma Howard Williams. She never thought she would marry and in her 30s was living at home with her father, Armstrong Howard. My father, James Williams, had been married to Theola Livingston and had four children. In giving birth to the fourth child, Theola died while in labor. This was January 1957, and my father desperately needed a wife to raise those four children and bring stability to the household while he worked the family farm. He knew my mother through her good name and sterling reputation. It was no secret that she was a virgin, and during those days that was something that ladies coveted and cherished. As customary then, my father went to my grandfather and made it clear to him that he was in a desperate situation and was in need of a wife. Grandpa Howard said to my mother: “Thelma, I’m not gonna be with you always and someday you’re gonna get old and regret not having children and a family of your own.” Then, having never known each other, dated, kissed or even hugged, they were married one month later in 1957. My mother, Thelma Williams, was thrust into an inherited family of four and eventually had eight children of her own, two of them stillborn. She loved the first four as if they were her own and struggled mightily to provide a loving, nurturing and stable household for our family. Well, according to the calendar, it’s Mother’s Day again. I’ve written about this subject consistently for the past 25 years. Oftentimes at my Washington DC home, I invite elderly ladies from the church over for Saturday brunch. 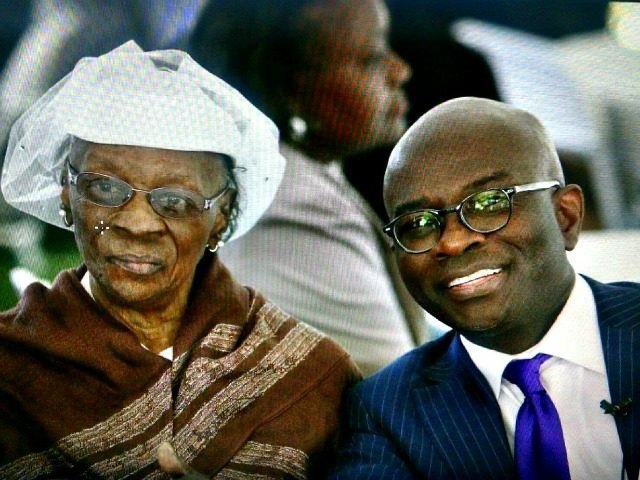 We celebrated my mother’s 90th birthday on April 9 with 250 well-wishers (including Dr. Ben & Candy Carson, David & Jane Smith, Attorney Benjamin Crump, and 12-time gospel Grammy award winner Shirley Caesar, to name a few) and they all fell in love with my mom all over again. The UK also celebrated Queen Elizabeth’s 90th birthday on April 21. My connection was that she and my mother were born in the same year and one week apart. And like Elizabeth, my mother has never worn pants, always wears a hat in public and always elevates the dress code wherever she goes. Mom knows how to put those threads together. I also find myself always wanting to give a senior person a hand or give up my seat. I’ve never met a senior citizen I couldn’t talk to, and I finally figured out why: because my sensitivity and dedication to my own mother as she grows old has made me more sensitive and caring toward those in their jubilee years. My mother, who turned 90 on April 9, is sweet and adorable and is in much more need of her children than ever before. Yes, she gives the impression that she is still tough and independent, but the simple things remind us that she is getting older and that we need to enjoy every waking moment with her. This is why on this Mother’s Day we will celebrate with my mom at her country estate in SC. The sadness of all of this is that so many sons and daughters these days go through life never understanding what it means to have really loved and been loved unconditionally by the progenitors of our society. The Bible’s definition of love could not have described a mother’s love for her children more poignantly. My siblings and I never have to wonder where our blessing lies in life because just hearing her gentle voice or seeing her caring face is a reminder of all the love we’ve received. In my lifetime, I have seen five of the original seven wonders of the world: the Taj Mahal, the Pyramids, the ruins of the Parthenon, the Great Wall of China, and what’s left of the hanging gardens of Babylon. Those are incredible and magnificent creations, but I’ve concluded that the greatest wonder of them all is a mother’s love. Mr. Williams is Manager / Sole Owner of Howard Stirk Holdings I & II Broadcast Television Stations and Executive Editor of American CurrentSee online Magazine. Watch our Right Side Forum every Saturday Live Newschannel 8 TV 28 in DC, 10:30 am – 11:00 am and repeats 6:30 pm est.